SGA senators give thier opinion to Jarett Lujan on whether or not homecoming committee members should be allowed to participate in homecoming events. The Student Government Association passed multiple bills in its meeting Feb. 5 in the CJ Davidson Center and added two new senators. The senate discussed amending Bill 89.11, which was passed on Jan. 29. The bill concerns the charging stations in the Porter Henderson Library. "We had allocated some money for a library charging station that you can see in the library," Student Body President Emily Hecox said. "So if people forget their charging cords, they can just go up to it and plug in their phone." Hecox said the station cost less than they originally budgeted for and the library split the cost with them. "We had to amend the bill to make sure that the amount that we paid for it matched with what the senate had passed," Hecox said. Bill 89.12, which talked about the Ram Family Scholarship that started in the 87th session, was passed. "It’s a scholarship for students by students," Hecox said. "In the fall it was endowed, so that was a big step in maintaining the scholarship for years to come." Hecox said they will run three different fundraiser events this semester to raise money for the scholarship. The first will be on Valentine’s Day; they will give carnations and Crush sodas to students who donate. people will apply for it, and it will be awarded at the Rammys in April," Hecox said. Hecox said Bill 89.13 will recognize the third week of February as RA Appreciation Week. "It’s something for the senate to do that recognizes the RA’s for all the hard work they do," Hecox said. Sophomore Brayden Woods, the senator who thought of the idea, said he wanted to recognize the students and the commitment they make to the university as resident assistants. "It’s a 24-hour, seven-days-a-week job, and sometimes 365 days a year," Woods said. "They really take the time out of their day." The two new senators sworn in were junior Mark Smolka and senior Cody Kretschmer. Smolka said he wanted to make a difference on campus. "SGA makes a lot of the big decisions that happen on campus, and I want to be a part of that," Smolka said. "I was also looking to get more involved: I’m a junior, I want to do a little bit more as I’m finishing out." Jarett Lujan, Homecoming Coordinator and Greek Life Coordinator, came to talk to the senate to discuss some issues. "Last year there was a little bit of backlash with the homecoming committee members being able to participate in the homecoming events," Hecox said. Hecox said Lujan was seeking SGA’s opinion on the issue. "It’s the best place to come because we have people representing a bunch of different organizations and departments," Hecox said. 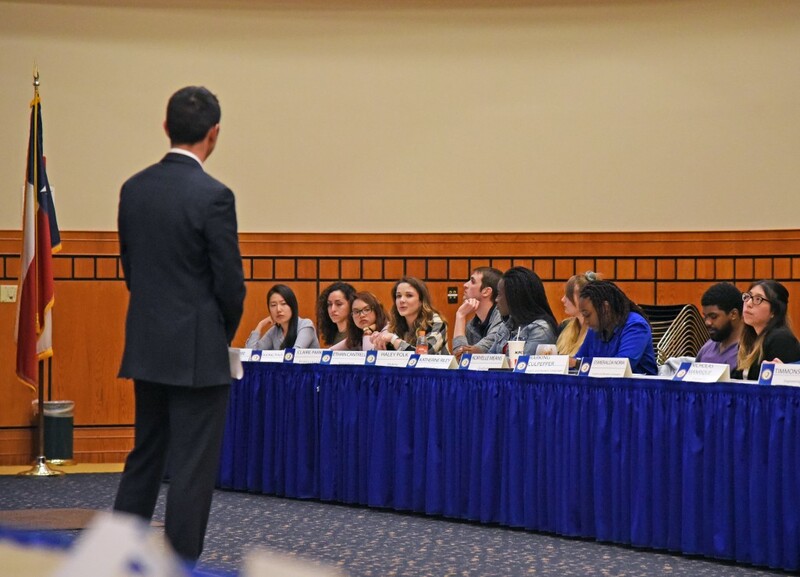 The Student Government Association will have its next meeting on Feb.19 in the CJ Davidson Center.